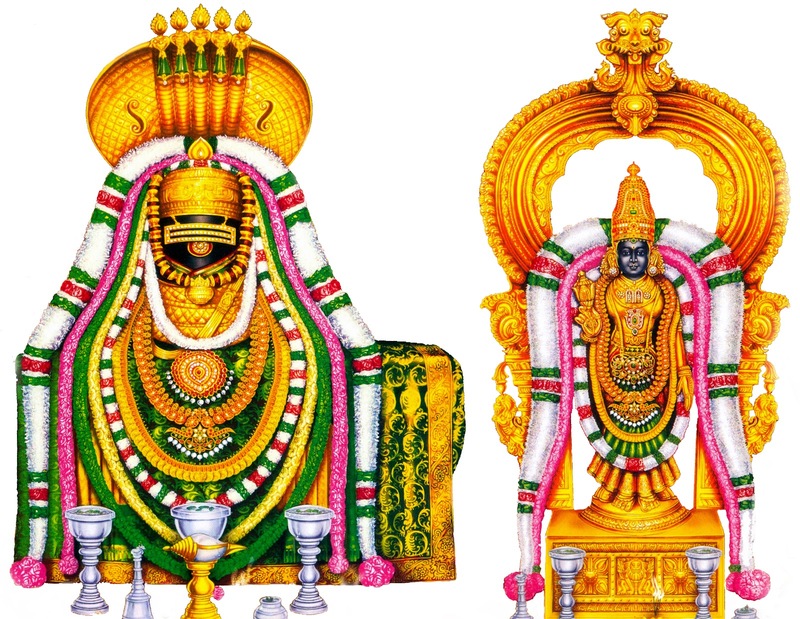 The presiding deity here is Ekambareswarar or Shiva, worshipped as the Prithivi Lingam. A Somaskanda panel featuring Shiva, Parvati and Skanda adorns the rear of the main shrine, which has been held in worship for centuries together. It is believed that Parvati, the consort of Shiva worshipped him in the form of a Prithivi Lingam, or a Lingam improvised out of sand, under a mango tree. Legend has it that the neighboring Vegavati river overflowed and threatened to engulf the Shiva Lingam and that Parvati or Kamakshi, embraced the Lingam, and Shiva, touched by the gesture materialized in person and married her. The presiding deity here is Jambukeswarar or Shiva, worshipped as the Appu(water) Lingam. Thiruvanaikoil is a beautiful small urban village at Tiruchirappalli district in Tamil Nadu of Southern India.There is said to have been a forest of Jambu trees near the Chandrateertha tank (filled with the water of the Kaveri) here and Shiva is said to have appeared under one of the trees as a Shiva Lingam. Legend has it that two devotees of Shiva were born under the influence of a curse as a white elephant and a spider. The elephant worshipped Shiva with flowers and water brought in its trunk (hence the name Tiru Aanaikka). The spider worshipped the Lingam by spinning a web on top, to protect it from falling leaves. 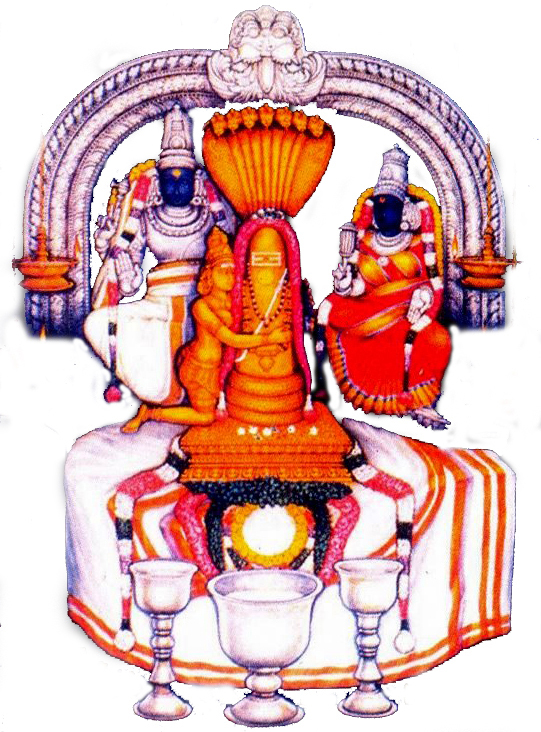 The presiding deity here is Annamalaiyar or Shiva, worshipped as the Agni Lingam. Legend has it that Shiva manifested himself in the form of a massive column of fire, whose crown and feet, Bhramma and Vishnu attempted in vain to reach. (See: Lingodbhavar) A celebration of this manifestation is seen today in the age old traditions observed in the Shivaratri and the Kartikai Deepam Utsavams held here. 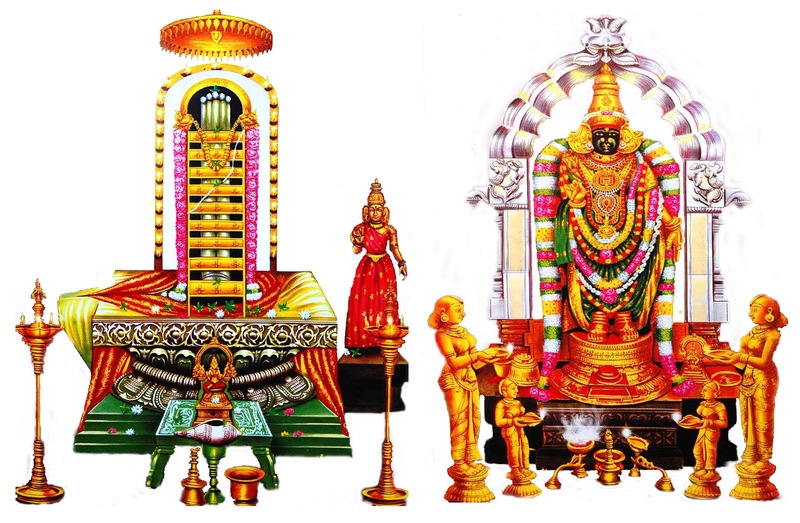 The presiding deity here is Kalahastheeswarar or Shiva, worshipped as the Vayu Lingam.The legend here is similar to that of the Jambukeswara temple at Tiruvanaikka. Shiva is said to have given salvation to a spider, elephant and a serpent who were ardent devotees of the Shiva Lingam located here. 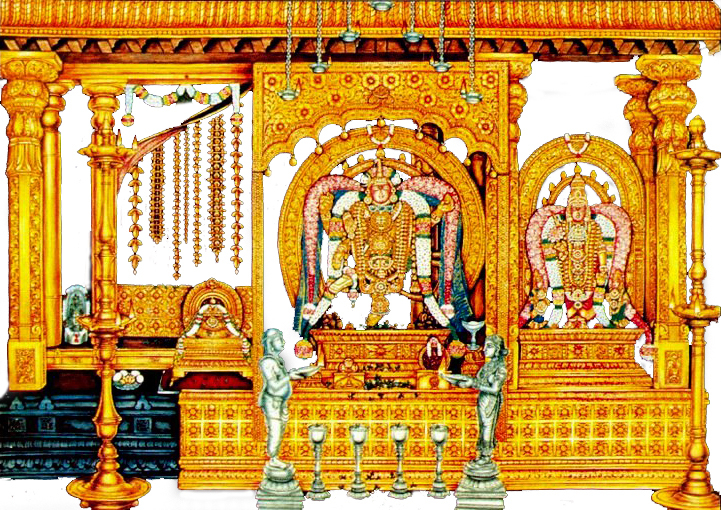 The presiding deity here is Chidambaranathar or Shiva, worshipped as the Akasa Lingam.Legend has it that Aadi Seshan, the serpent (couch) of Vishnu, heard Vishnu’s exhilarating description of Shiva’s Dance of Bliss. Filled with irrepressable desire to witness this dance in person at Chidambaram, Seshan descended to the earth as Patanjali (the one who descended). Vyagrapaadar, another devotee of Shiva prayed to obtain the tiger’s claws so that he could obtain with ease the sacred Vilva leaves meant for Shiva’s worship at Chidambaram. The two sages spent their time in prayer and meditation – in anticipation of Shiva’s Ananda Tandavam. At the appointed hour, Shiva (with Sivakami) granted to Patanjali and Vyagrapaadar, a visual treat in the form of his Cosmic Dance of Bliss, to the accompaniments of music played by several divine personalities in the Hindu pantheon. This Dance of Bliss is said to have been witnessed by Vishnu, and there is a Govindaraja shrine in the Natarajar temple commemorating this.